The ICX Association’s 2018 Elevate Awards were handed out in 12 categories; Top awards went to Panera Bread—ICX Influencer of the Year and Sleep Number—ICX Deployment of the Year. 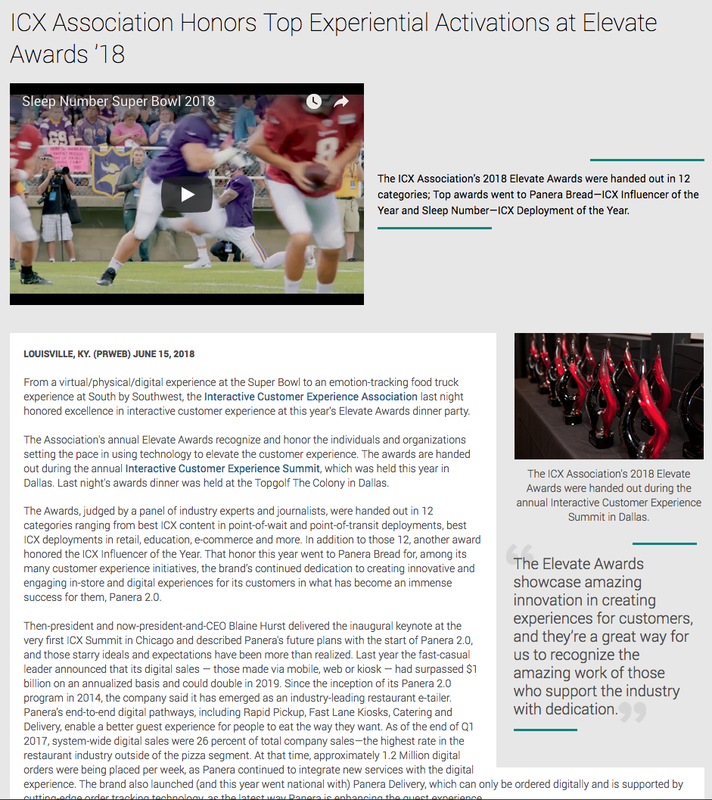 From a virtual/physical/digital experience at the Super Bowl to an emotion-tracking food truck experience at South by Southwest, the Interactive Customer Experience Association last night honored excellence in interactive customer experience at this year’s Elevate Awards dinner party. The Association’s annual Elevate Awards recognize and honor the individuals and organizations setting the pace in using technology to elevate the customer experience. The awards are handed out during the annual Interactive Customer Experience Summit, which was held this year in Dallas. Last night’s awards dinner was held at the Topgolf The Colony in Dallas. The Awards, judged by a panel of industry experts and journalists, were handed out in 12 categories ranging from best ICX content in point-of-wait and point-of-transit deployments, best ICX deployments in retail, education, e-commerce and more. In addition to those 12, another award honored the ICX Influencer of the Year. That honor this year went to Panera Bread for, among its many customer experience initiatives, the brand’s continued dedication to creating innovative and engaging in-store and digital experiences for its customers in what has become an immense success for them, Panera 2.0. Then-president and now-president-and-CEO Blaine Hurst delivered the inaugural keynote at the very first ICX Summit in Chicago and described Panera’s future plans with the start of Panera 2.0, and those starry ideals and expectations have been more than realized. Last year the fast-casual leader announced that its digital sales — those made via mobile, web or kiosk — had surpassed $1 billion on an annualized basis and could double in 2019. Since the inception of its Panera 2.0 program in 2014, the company said it has emerged as an industry-leading restaurant e-tailer. Panera’s end-to-end digital pathways, including Rapid Pickup, Fast Lane Kiosks, Catering and Delivery, enable a better guest experience for people to eat the way they want. As of the end of Q1 2017, system-wide digital sales were 26 percent of total company sales—the highest rate in the restaurant industry outside of the pizza segment. At that time, approximately 1.2 Million digital orders were being placed per week, as Panera continued to integrate new services with the digital experience. The brand also launched (and this year went national with) Panera Delivery, which can only be ordered digitally and is supported by cutting-edge order tracking technology, as the latest way Panera is enhancing the guest experience. Kyle Phillips, director of delivery systems on Panera’s Digital Experience team, accepted the award last night for Panera Bread. The ICX Deployment of the Year award went to Sleep Number for their virtual reality and digital activation at the Super Bowl in Minneapolis, one that resulted in thousands of leads for the brand and hundreds of thousands of impressions on potential customers. The Awards ceremony and dinner party were held in conjunction with this year’s ICX Summit, held nearby at the Omni Frisco Hotel. The Summit is an annual conference devoted to showcasing the innovative ways technology can be used to create transcendent customer experiences.